Some things have an intrinsic value. The most-obvious example is a stock with a dividend. The absolute floor for an equity is its dividend and so long as their is a profitable business behind it, the value is a multiple of that dividend. Other things don't have an intrinsic value. This includes virtually everything that doesn't produce a yield. Oftentimes, prices of those things rise and fall based on future expectations of what profits or yield might be. In other cases, there is an estimation of utility. Oil, for instance, can be refined into gasoline which can be used to move things or for dozens of other uses. Oftentimes there is a dispute about utility or a dispute about future profitability, which can lead to a dispute about prices. One way to resolve this is a model but oftentimes that's so fraught with assumptions that it's useless. So how do you establish prices? Obviously, via the market. This is when storytelling, which is another way of saying a sales job, takes over. Cryptocurrencies are an obvious example. A Bitcoin has no yield but it has some utility. To some, that utility is replacing the US dollar as a global transparent currency. To others, it's a way to facilitate transactions. And for others still, it's a handy tool for criminal transactions. How you price it then, depends on how you view the future utility. Another way to price it is simply looking at how others view it. You might believe that all of those utilities are baseless but if you believe that others are buying it because they believe those things, then it's rational to buy. That reasoning is why I argued more than a year ago that Bitcoin wasn't a real currency but that it was still going higher. The only trade on BitCoin is the hype trade. The fundamentals don't matter. The only thing that matters is how enthusiastic the true believers are. 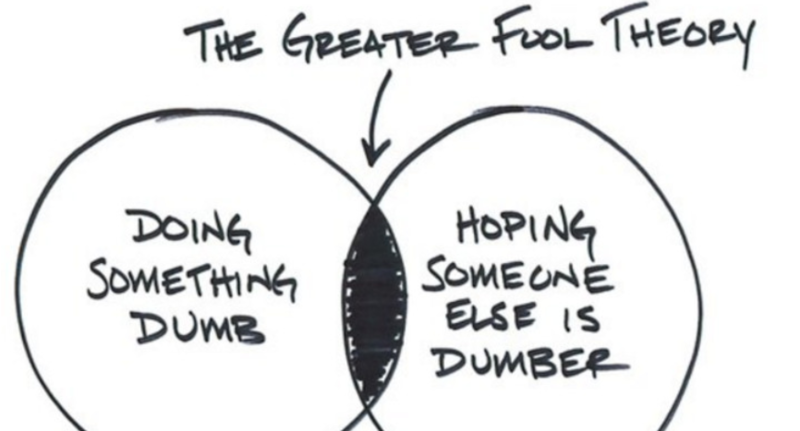 This is all called the greater fool theory. The idea is that something can always rise so long as there is another person who believes it will. You can argue that Bitcoin was simply a great story. It was full of buzzwords about transparency, trust, tracking, efficiency plus it was just complicated enough that it wasn't accessible yet alluring in the way that all technical innovations are. The price essentially tracked the rise in its exposure. As more people learned about it, a certain portion invested. The problem is that eventually you run out of people. For crypto, a month or so before the top, I remember talking to a distant relative who is an absolute blowhard. He had just bought some and I told my wife that had to be the beginning of the end. Other people were telling stories about their grandparents were asking them how to buy crypto. Making buy/sell decisions based on what you hear from people on the street sounds ridiculous but some of the most famous traders are just that. Joe Kennedy, John F Kennedy's father, famously said he sold his entire stock portfolio before the 1929 crash because a shoeshine boy gave him some stock tips. And he figured that when the shoeshine boys have tips, the market was too popular for its own good. Imagine a beauty pageant, where the judges knew that, because beauty was in the eye of the beholder, the contest would be decided on the judge's perception of beauty. Someone who wanted to predict the outcome would have to assess the judge's perceptions, not the contestant's beauty. As a result, your vote for the winner would not depend on who you thought was prettiest. Instead, your vote would depend on how you thought the judges would vote. How do you trade a bubble? In anything where there is no intrinsic value, utility or there is so much uncertainty that it's impossible to evaluate, there is no real analysis of the market. Instead, you are simply evaluating what other people think. 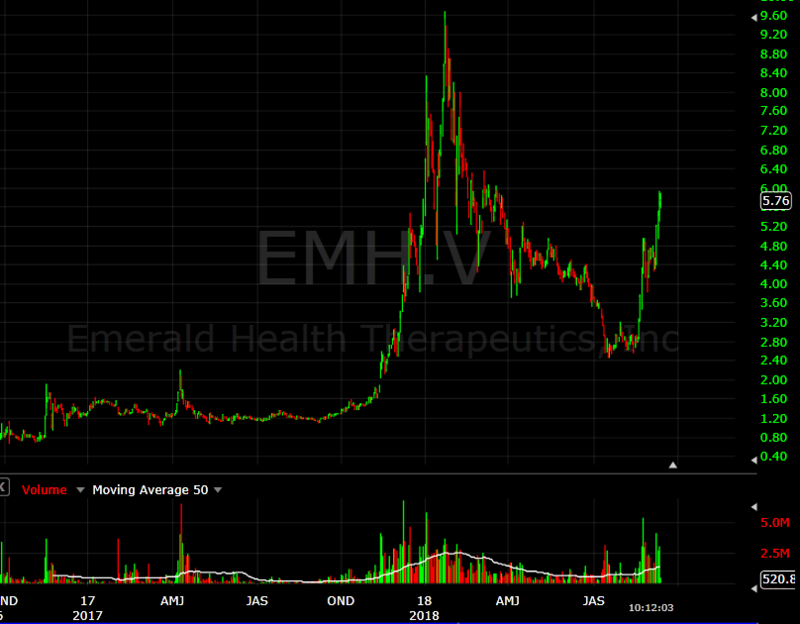 The great bubble at the moment is in marijuana stocks. The story is that it will be legalized. That's already happened in Uruguay and in October it will happen in Canada. That set off a bonanza of speculation about how companies will make a mint selling marijuana. Pot stocks have absolutely soared. It started last year in Canada with some producers rising 10x in a few months. A second wave of the bubble has kicked off on the belief that marijuana will eventually be legalized globally. 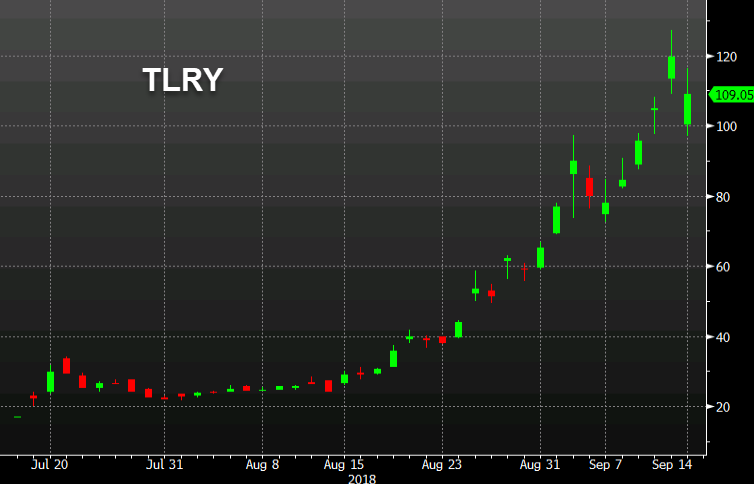 It ramped up with the Nasdaq listing of Tilray; it's the first US listing of a pot company and it's average a 15% gain per day since it's was launched. Someone who bought on the IPO, or in early Aug, is up more than 500%. Here's the problem. Marijuana is extremely easy to grow. It's called weed because you can grow it in a ditch. Sure, the quality might vary but if you could grow a lower-quality iPhone in your back yard, then Apple wouldn't be a trillion dollar company. But in a bubble that doesn't matter. Marijuana legalization is a great story. People undoubtedly spend a lot of money on pot and companies could make money doing it. It's not a story I believe yet it's compelling enough that fools around the world are going to believe it. ForexLiveHere's the Google search trends chart for 'weed stocks'. The lesson is simple. When you're evaluating some assets, you don't necessarily need to be able to make sense of them. You are just evaluating the story. If it's compelling enough, the asset will continue to rise until the supply of fools is exhausted. Simply: The price you should buy something isn't always its intrinsic value, or utility -- it's what you think someone else will pay for it.